You look lovely today. That shade of green does wonders for your skin. Very festive, very Irish. Me? I'm wearing brown and tans. I have no green clothing (other than a super cute jacket) so I've decided I'm still participating, but instead of sporting around like a leprechaun, I'm going as an Irish potato. To help, I give you peanut butter cups. These take under 45 minutes to make, most of that time is for chilling, use no heavy duty appliances. Just a microwave and a couple glass bowls. They are rich, chocolaty and peanuty all in a couple of bites. A single bite if you don't want to talk to anyone. They give the well known version of a peanut butter cup, a run for it's money. I'm thinking you could even swap out the semisweet chocolate for a green baking chocolate. But only if you're feeling up to it. I'm sticking with the browns. 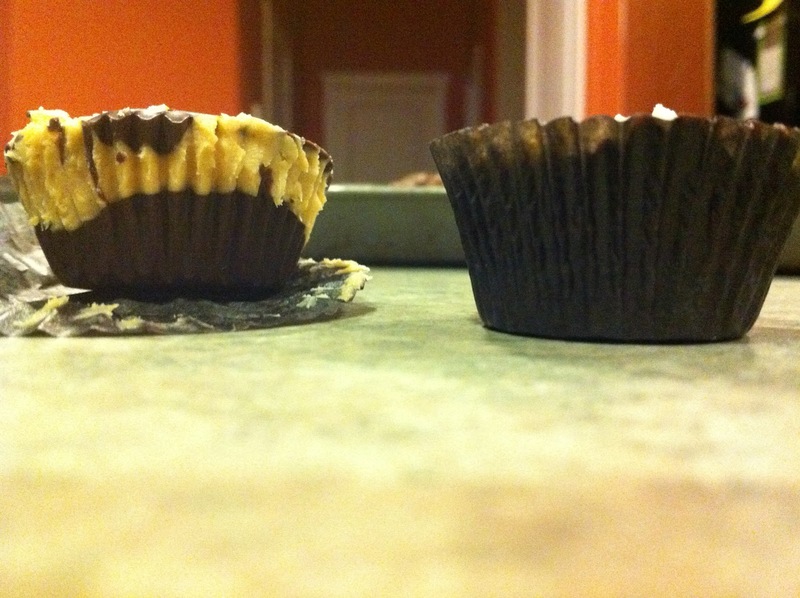 When you finish making these peanut butter cups, please check out http://www.forjapanwithlove.com/. It's started by Lydia @ Utterly Engaged to fundraise and raise awareness for the people of Japan who desperately need help, through cash donations for basic needs like food and shelter. Friday March 18th, 2011 is Bloggers day of silence, which I will be participating in. Basically, you don't post tomorrow as a show of solidarity to help the people of Japan. I would ask all of my blogger friends to check out the website or email info@utterlyengaged.com or lydia@ever-ours.com for more information and to sign up. By contacting their local Red Cross office. Cheques should be made payable to the Canadian Red Cross, earmarked “Japan Earthquake/Asia-Pacific Tsunami” and mailed to the Canadian Red Cross National Office, 170 Metcalfe Street, Suite 300, Ottawa, Ontario, K2P 2P2. I would love if you would join me in this unique way of helping the people of Japan, who so desperately need it. I'll give you a peanut butter cup and stop referring myself as an Irish potato. Pinky swear. Line a mini muffin tins with paper liners, set aside. In a large microwave safe bowl, combine peanut butter and white chocolate, microwave on high for 1 - 1 1/2 minutes, or until almost completely melted, stirring halfway through. Set aside. In another large microwave safe bowl, add semisweet chocolate and microwave, on high for 2 - 3 minutes, stirring halfway through, until almost completely melted. Using a spoon or if you were smart enough to use a bowl with a lip, pour peanut butter mixture and chocolate mixture into prepared muffin tins, starting and ending with the semisweet chocolate. Sprinkle with chopped peanuts. Place muffin pan in freezer until peanut butter cups are firm, about 15 - 20 minutes. Let come to room temperature before serving or risk a broken tooth. Store any extras in the refrigerator.